We’re well into the last quarter of the year and for many of us grown folk, the holidays are starting to become top of mind. From finally getting a break from the office to gifting loved ones. At this point, I’m sure we all have a close little one in our lives (not just us mamas); be it a niece, cousin or sibling. With the holiday season speedily approaching, it’s a good time to think about what gifts could be on your list. I first had Fisher Price products in my home when Kai was about 4 months old. His grandparents started having Grandparents’ Day with him, so they bought a bunch of toys to keep at their house for whenever he spent the day there, and most of them were from Fisher Price. We all know that children learn wonders through play, so the more a toy helps him grow, the better. Being a mom now, I really see that not all toys are made equal and I purposefully choose those that serve a bigger purpose by teaching Kai and encouraging his brain development. I was really excited about getting this toy for Kai. Kai’s been walking for the past 5 months so he’s all over the place! Apart from books, he’s really not that interested in things that don’t move at the moment. When I heard that this toy uses music and dancing to help with a child’s motor skills, I thought it’d be perfect for my boy. I hadn’t even removed Bo Bo (what we’re calling him) from his packaging and Kai’s eyes were already about 6 times bigger than their usual enormity. He’s a very cute alien-looking creature with big, bubbly eyes and equally bubbly and massive feet – for dancing I guess. I had barely put him on the mat before Kai grabbed him and started poking at him, then looking back at me with a big smile of delight. BeatBo has 4 activation buttons, all with different functions. The main one is the massive one on his tummy and the rest are on his feet. Main button (tummy): Plays songs that are fast, slow, and even a capella. There’s no theme to these songs and so far I’ve only heard maybe two of the same one. His tummy also lights up in different colours and patterns. Dance n’ Move (button 1): Plays a variety of different songs, most with instructions on which move to ‘bust’. It encourages the child to move to the beat. BeatBo also moves his body from left to right. Learning & Games (button 2): Plays songs about colours, numbers and a sweet rendition of the alphabet. It also has the cute ‘Freeze Dance’, a song that calls for dancing and freezing when the beat pauses. Sing-a-long (button 3): Press this button to activate the sing-a-long function. 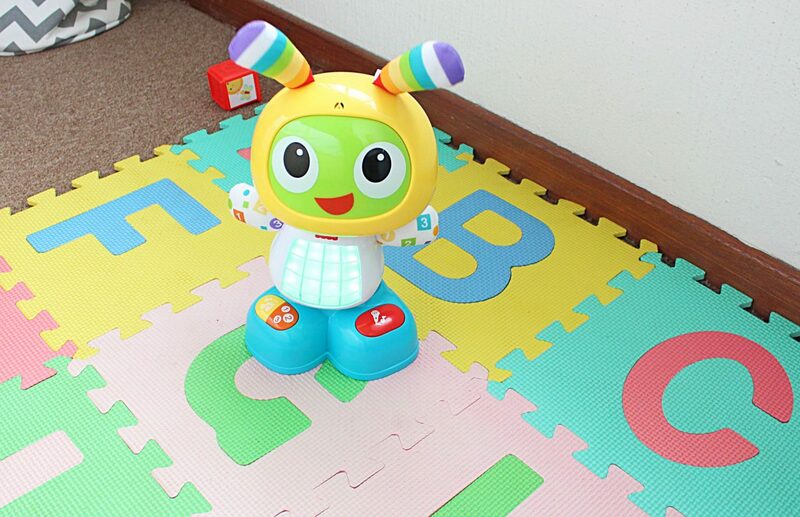 When BeatBo’s tummy turns red, it records a word or phrase that you or baby says, then remixes it into a song. This is by far my favourite function. Much fun was had with this one and once Kai starts saying more words than “mamama” and “bebe”, I’m sure he’ll be coming up with some interesting lyrics. It’s suitable for children between 9 – 36 months. I love that it encourages a child’s natural curiosity and eagerness to learn through activity. Suffice to say, this past weekend my house was turned into a little toddler’s disco with Bo Bo’s voice calling out instructions and Kai bobbing and swaying his little body. 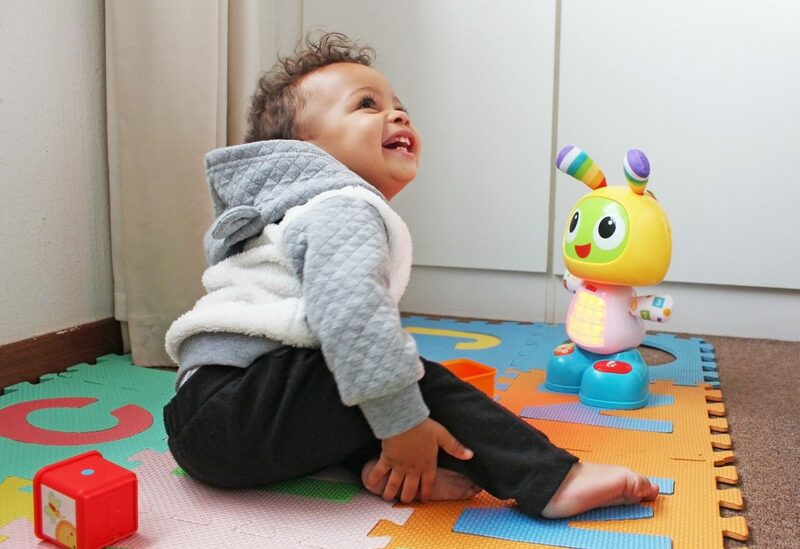 At the moment, he doesn’t completely understand what Bo Bo’s saying of course but I doubt it’ll be long before he claps when BeatBo says to, and is jumping up and down in tune to the beat. 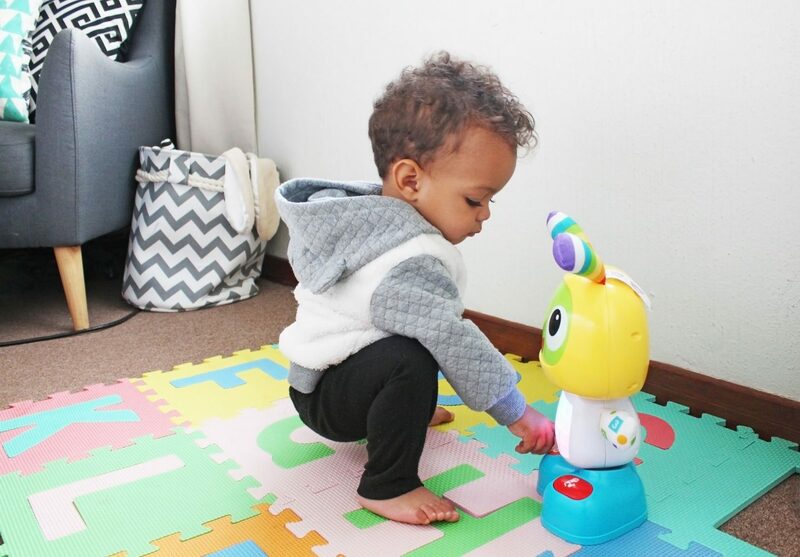 You can get the Fisher Price BeatBo at Babies ‘R’ Us for R1,199.